Step inside, and you'll be amazed at my cozy feel and numerous offerings. I am not just a glorified tent, I am a comfortable and secluded escape from your everyday hustle and bustle. I provide the comforts of your home, yet have stripped away all the nonsense, all the distractions, all the noise and stress. 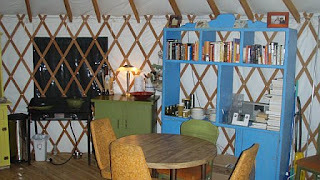 You have now stepped into "The Yurt". Enjoy! 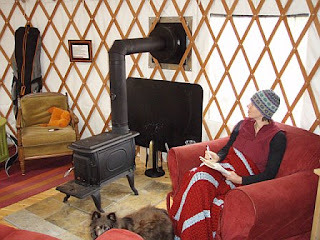 I am fully insulated from floor to ceiling, so a quick switch to the small propane heater or a couple logs in the wood burn stove, will take the nip off the coldest of days. A ceiling fan will also help circulate the warm air flow and keep your toes warm at night, and the 3 windows and liftable dome can help circulate cool air for the warmer months. I can light up the night quickly with the almighty power of the sun. 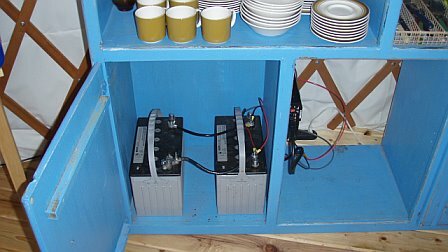 I'm equipped with a small solar system for basic appliances, including lamps, so you can snuggle up on the couch and read about your next day's adventure. When you're ready to catch some Z's, you'll choose between a queen sized bed, a Full Size futon, a single cot, and a large comfortable couch that doubles as a single bed. I have clean sheets, blankets and pillows on the bed for every new guest. You'll fall asleep, stargazing through the clear ceiling dome, and wake up to the snowcapped mountains of the La Sals. It doesn't get any better than that. Entertainment:If hanging around the living room and talking about your exciting day is not enough entertainment in itself, you can help yourself to the extensive book library, where you'll find maps, guides, magazines, and a hodge podge of novels. You can also rock out to the MP3/I-Pod speakers, play a movie on the small DVD player, play a game of texas hold 'em with the poker kit, and other board games.